Stavroula Foteinopoulou is a Research Professor with the Electrical and Computer Engineering Department of The University of New Mexico. She received her Ph.D. in Condensed Matter Physics from Iowa State University and has held post-doctoral positions in U. of Namur (Belgium) as well as the Institute of Electronic Structure and Laser (IESL) of FORTH (Greece). She was a Lecturer at the University of Exeter (UK) until 2014 prior to joining Univ. of New Mexico. Her research in theoretical/computational photonics focuses on conceiving new photonic structured materials for extraordinary light control across the EM spectrum. She has authored more than 30 journal publications and conference papers, which have attracted to-date more than 2800 citations (source google scholar). She also holds one US patent. 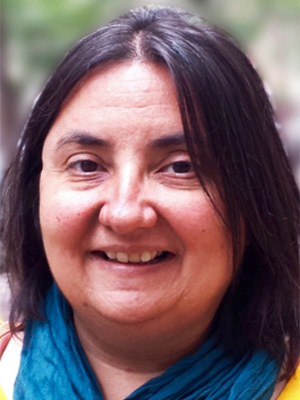 Stavroula is serving as an associate editor for the OSA Optical Materials Express (OMEX) Journal, as well as for the Journal of the European Optical Society: Rapid Publications (JEOS-RP). She is also a Chair of the annual SPIE conference Active Photonic Platforms. In 2016 she was recognized by the American Physical Society (APS) as an outstanding referee.